Located in East Java, Indonesia, the colossal Kawah Ijen volcano produces stunning ‘rivers’ of blue fire. Although this spectacular phenomenon can only be witnessed in the dark, the blue flames actually burn throughout the day. As a result, the most popular way to see the incredible blue fire in the crater of Kawah Ijen is by hiking to the summit on a sunrise tour. This allows tourists to witness the fire before watching sunrise from the summit of the volcano. Also known as Mount Ijen, the volcano has more to offer than blue fire, as it’s also home to the largest highly acidic crater lake in the world. The unique nature of the volcano makes it a brilliant spot for sulphur mining. 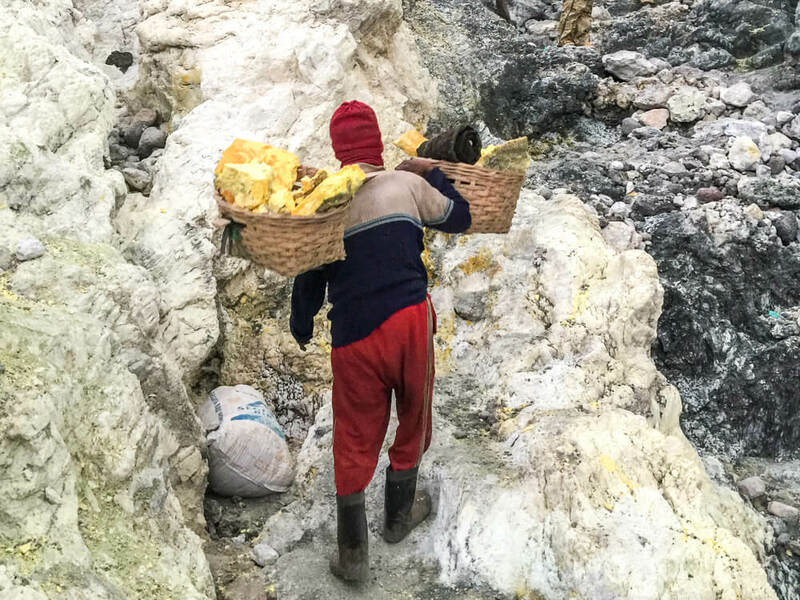 Many local miners hike Mount Ijen multiple times a day to extract sulphur, putting their wellbeing in danger despite the very low rate of pay. Toxic gases are regularly present at the volcano, and can sometime lead to it being closed off to the public, so it’s important to wear a gas mask at the summit for protection. 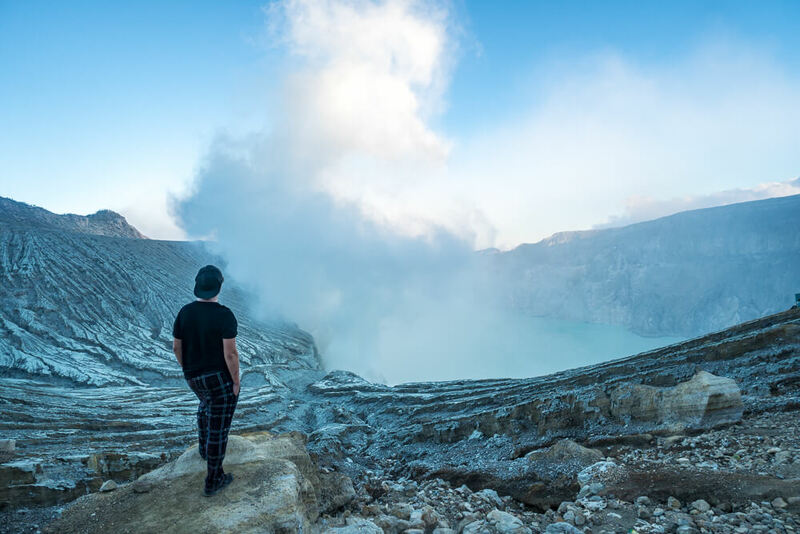 This travel guide covers everything you need to know before you visit Kawah Ijen volcano – including information on the amazing blue fire, how to arrange a tour to Mount Ijen, the struggle of the miners and more! 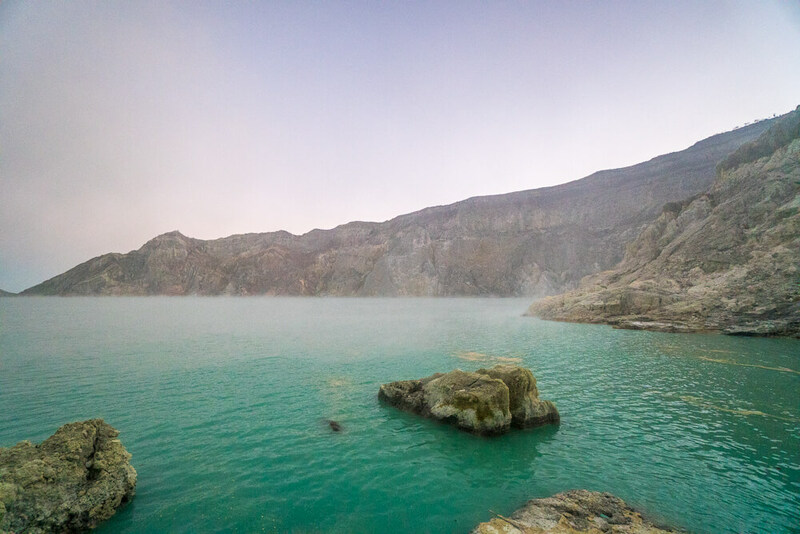 Kawah Ijen weekday entrance fee – 100,000 Rupiah. 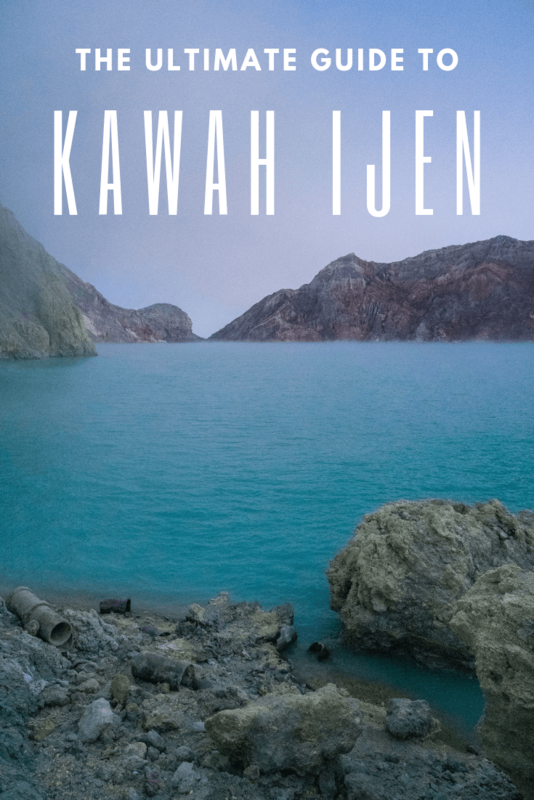 Kawah Ijen weekend entrance fee – 150,000 Rupiah. Kawah Ijen height – 2,799 metres. Last eruption of Kawah Ijen – June 1999. Kawah Ijen location – The border between the Banyuwangi Regency and Bondowoso Regency of East Java, Indonesia. The closest city to Mount Ijen is Banyuwangi. It’s the most common place to stay when visiting Kawah Ijen, and is located around a 1-1½ hour drive away from the start of the hike. To get to Banyuwangi from Bali you will need to take a ferry. If you’re already in Malang, Probolinggo or somewhere else in Java, you can get to Banyuwangi by train or bus. The ferry to East Java departs from Gilimanuk – a small port town on the west side of Bali. We recommend getting to Gilimanuk from Lovina beach as you have the option of travelling by bus or taxi. If you wish to travel by bus you have 2 options – the public bus or the shuttle bus. The shuttle bus from Lovina to Gilimanuk is the quicker option and costs 150,000 Rupiah each, whereas the public bus costs just 70,000 Rupiah but has no air con and can make a fair few stops along the way. Alternatively, you can opt to take a taxi from Lovina, which should cost around 300,000 Rupiah one-way to Gilimanuk. Tickets for the ferry from Gilimanuk to East Java can be bought at the port and cost just 6,500 Rupiah. Ferries leave around every 45 minutes and take 45 minutes to reach Java. In our experience there weren’t many taxis available upon arrival in Java, so we recommend having an Indonesian SIM card so that you can order a Grab to pick you up. Alternatively you can try and arrange transport in advance through your accommodation. From the port it should take around 15-20 minutes to get to Banyuwangi. In total the whole journey from Lovina beach to Banyumangi took us about 4 hours. If you want to travel from elsewhere on Bali the easiest way to reach Gilimanuk is by taxi, but the cost will vary depending on where you are coming from. If you’re already in Java then the best option is to take a train. It takes around 5 hours by train from Probolinggo to Banyuwangi, or around 8 hours from Malang. Although buses are an option, they can take much longer as there is a lot of traffic in Java. We recommend booking train tickets in advance, especially if you plan to travel on a public holiday or during the weekend. You can book both trains and buses in advance on Traveloka’s website. Once you are in Banyuwangi you are well placed to reach Mount Ijen. You can either arrange a tour/transport from Banyuwangi itself or alternatively you can stay in one of the villages along the road to Ijen. There are a number of homestays in these villages, most of which are able to help you arrange a tour to Mount Ijen. It’s worth knowing that there isn’t much to do in these villages, which can make it a peaceful place to stay but also means there isn’t much to do other than visit Ijen! Alternatively you can book a tour from Bali to Kawah Ijen on Get Your Guide. 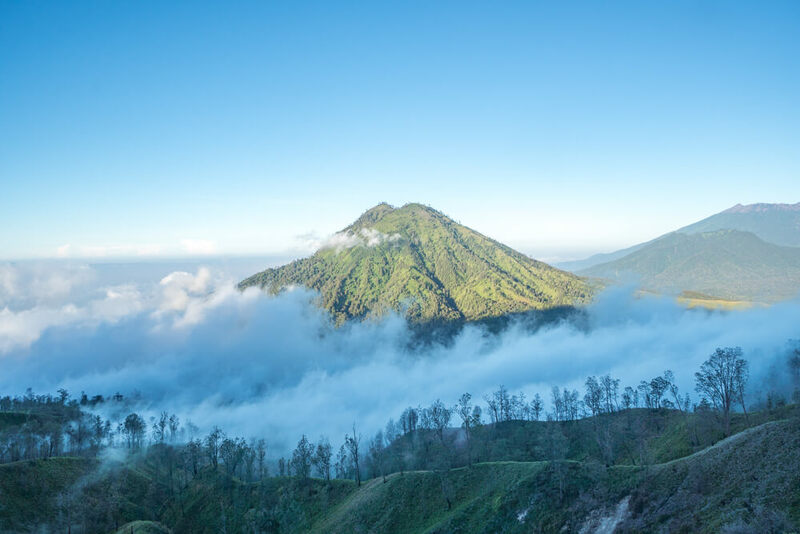 If you’re going to book a tour from Bali we recommend booking a combined Mount Ijen and Mount Bromo tour so that you can enjoy both of these spectacular volcanoes. Although these tours are more expensive, they’re a good option if you’re on limited time or just don’t want the hassle of sorting it all out for yourself. Click here to check out the tours available on Get Your Guide! The best time to visit Mount Ijen is between April and October as this is the dry season. If you choose to visit during November and March it is the rainy season so the path can be quite muddy and slippery, which will make the hike substantially harder. To see the famous blue fire (often mistakenly referred to as blue lava) you need to hike to the crater of the Kawah Ijen volcano before sunrise. This requires a very early start as it takes around 90-120 minutes to hike to the crater viewpoint. To get there in time you realistically need to start the hike a minimum of 2 hours before sunrise, but preferably even earlier if possible! If you aren’t interested in seeing the blue flames and would like to avoid the crowds then you can start the hike slightly later. By starting the hike up at around sunrise it will be less busy as most visitors will already be at the top by then. Unfortunately it’s not currently possible to visit at sunset as the crater closes at 12pm each day. Although the majority of Western tourists often overlook Mount Ijen in favour of visiting Bali, it has become an increasingly popular spot to visit. 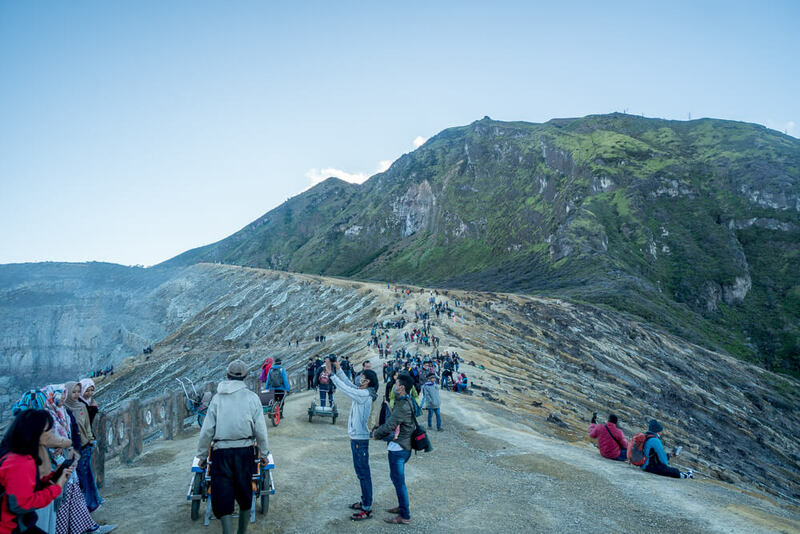 For Indonesian tourists though, Kawah Ijen is a major attraction. This means it can get extremely busy during weekends and public holidays. If you have the time, we recommend to plan an extra day or two in the area. 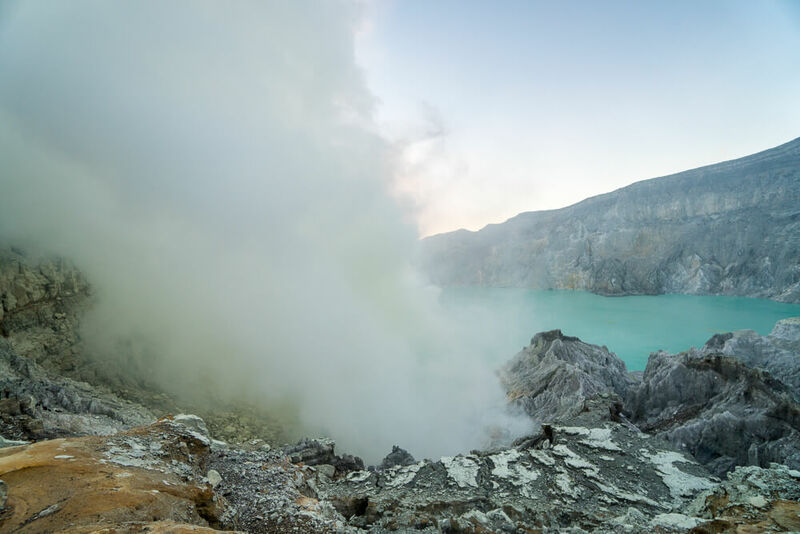 Occasionally toxic gases are released from the crater, which results in Mount Ijen being closed off to tourists. If you’re unlucky enough to visit when it is closed, staying an extra day or two could end up being the difference between being able to visit and not being able to visit! Allowing the extra time also gives you a better chance of seeing the blue fire at the crater if you don’t make it in time on the first try. The easiest way to visit Mount Ijen is by taking either a private tour or group tour from Banyuwangi or one of the nearby villages. As the blue fire can only be seen in the dark, most tours visit Kawah Ijen early so that you can see this unique phenomenon before you watch sunrise from the crater. This requires a very early start, with the majority of tours departing from Banyuwangi between 12am and 1.30am. We recommend booking a private tour to give yourself the best chance of seeing the blue fire. With a private tour you will have a greater say over the departure time and so, in theory, you can arrive as early as you want. Private tours to Mount Ijen from Banyuwangi vary in cost depending on the operator but prices start from around 350,000 Rupiah per person. Generally this is for a minimum of 2 people and won’t include the entrance fee. If you don’t have the budget for a private tour then we recommend booking a group tour with the earliest departure time as this will give you the best chance of arriving in time to see the blue fire. Group tours will have set departure times, but some operators depart earlier than others. We visited Mount Ijen on a group tour and only briefly managed to see the blue fire as the tour departed too late. Even though we completed the hike to the crater in 60 minutes we were able to witness the blue flames for just a few minutes before it was too light to see anymore. It was an extremely frustrating experience for us as we had been promised we would arrive in time, but the tour let us down. If seeing the blue flames is important to you then make sure to take the earliest possible tour! Group tours also vary in cost, but a reasonable price to pay is around 150,000 Rupiah excluding the entrance fee. Different tours will include different things, so it’s important to know exactly what you’re paying for before you book. In particular, you should check whether your tour includes the entrance fee as well as the use of a gas mask and headlight. Obviously if the tour is substantially cheaper but doesn’t include the entrance fee then it may even out. It is also worth checking whether your tour actually includes a guide. We were supposed to have a guided tour but our ‘guide’ didn’t actually do any guiding and just disappeared, leaving us to make our own way. This wasn’t too much of an issue for us, except that we were told to leave the crater at 6am to return to the car park only to find that the guide and others in our group didn’t leave at this time. We ended up waiting for around 2 hours at the car park before our entire group showed up and we could leave, which was again frustrating as we could have spent 2 more hours enjoying the incredible nature. There are 2 main ways to book tours to Mount Ijen – through your accommodation or online. Whichever you opt for it’s important to check reviews online before committing, as that way you can avoid ending up in a similar situation to us! If you can’t find any reliable information online then it’s probably safest to choose another operator with good reviews. It’s also worth noting that the earlier sunrise is, the earlier you will want to depart. Sunrise at Mount Ijen varies from around 5am-5.45am depending on the time of year, so make sure your tour arrives in plenty of time for you to make it to the crater before dawn! Assuming that you’re taking a sunrise tour to see the blue fire, then it will still be dark when you arrive to the Mount Ijen car park. If your tour includes a gas mask and headlight in the price then make sure to get these from your operator. Gas masks are available to rent at the start of the hike, but alternatively you can bring your own. After you’ve got everything you need, it’s time to begin the climb. The first kilometre is uphill but shouldn’t prove to be too much of a challenge. In contrast the second kilometre is very steep and we personally found it extremely tough. We recommend taking your time at this point and even stopping if you need to as it is the hardest part of the hike. Once you’ve finished that section there is around another kilometre and a half to go until you reach the summit of Kawah Ijen. Although this section is still uphill, it’s thankfully nowhere near as tough as the second kilometre. It takes around 90-120 minutes to hike to the summit of Mount Ijen from the car park. That being said, the hike can be completed in less time if you are relatively fit. We managed to complete the hike in around 60 minutes as we went as quickly as possible in order to see the blue flames. If you aren’t used to strenuous physical activity then it may take longer than 2 hours to reach the top, so it’s worth keeping that in mind if you want to see the blue fire! The viewpoint at the summit of Kawah Ijen offers great views of the crater and its large acid lake. When you arrive at the summit it is still likely to be dark, so you won’t be able to enjoy these views until after sunrise. In the darkness you will be able to see the blue fire that Ijen is famous for, but for the best view you need to actually hike down into the crater. As long as the conditions are good, then you are able to hike from the summit of Mount Ijen down into the crater. The advantage of doing this is that it allows you to get a better view of the blue flames. It’s particularly important to have a headlight at this point as it would be virtually impossible to do in the dark as the path is very uneven and rocky. Although it’s quite challenging, it’s manageable if you take your time. It should only take around 30-45 minutes to hike down into the crater. Before descending into the crater it’s very important to put on your gas mask. Plumes of poisonous clouds filled with hydrogen sulphide and sulphur dioxide rise from within the crater and can engulf you in a matter of seconds. This can make it very hard to breathe and inhaling the gases can be very dangerous, hence the importance of wearing a gas mask. The sulphuric gases produce a terrible smell similar to that of rotting eggs, which your mask should also help protect you from. It’s also a good idea to have protective eyewear as the gases can cause your eyes to sting badly. As we didn’t have anything to protect our eyes we had to keep them closed each time the plumes came in our direction. The blue fire at Mount Ijen is often mistaken for lava, but it is actually light created as a result of sulphuric gases combusting. Gases escape through the cracks in the volcano at high pressure and temperatures up to 600 degrees Celsius (1,112 degrees Fahrenheit). When these gases react with air they ignite and send flames up to 5 metres high. Some of these gases condense into liquid sulphur and continue to burn while forming ‘rivers’ of blue fire on the slopes of Ijen. These ‘rivers’ are the reason that the blue flames are often mistaken for lava. 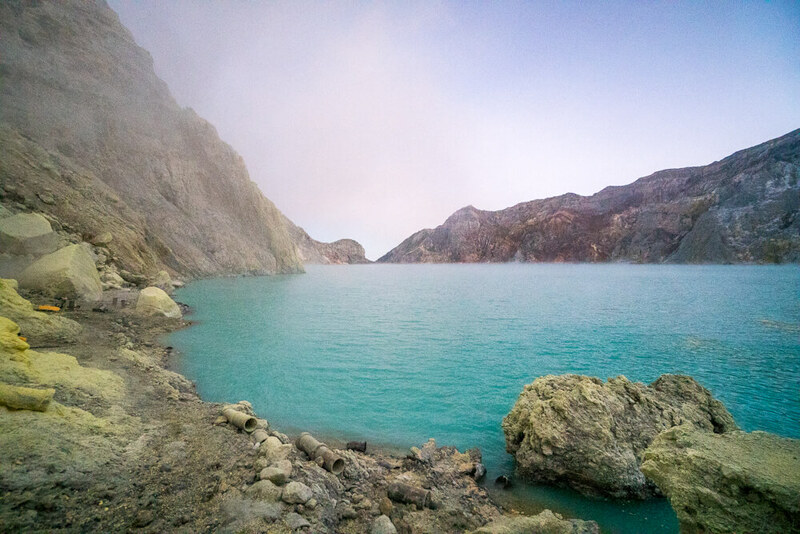 Although the phenomenon of blue fire occurs both day and night at Mount Ijen, it is only visible in the dark. For this reason it’s important to arrive as early as possible so that you can observe the blue flames before sunrise. If you arrive too late or take too long to hike up, then you’ll miss your chance. Blue fire such as this rarely occurs elsewhere in the world, making Mount Ijen one of the best places to see it. It’s a truly incredible spectacle, so it’s well worth the early start! For the best view of the blue fire you have to hike into the crater of Mount Ijen, but you should still be able to see it from the summit viewpoint. Unfortunately we didn’t manage to get any pictures of the blue fire as we only just arrived in time to see it. Considering how late our tour arrived we were lucky to see it at all. If you want to see pictures of the blue fire we recommend checking out this National Geographic post! While the blue fire is the main attraction for many, Mount Ijen is also home to the largest highly acidic crater lake in the world. The water in the crater lake is a distinctive turquoise-green colour and contains both hydrochloric and sulphuric acids. As a result, the pH of the water is less than 0.3, which means it is capable of dissolving metal – so you definitely don’t want to be going for a swim here! The acid lake at Kawah Ijen can be seen from the summit viewpoint, but if you want to get up close you need to climb down into the crater. By going into the crater you are able to stand right at the shores of the lake and enjoy this impressive work of nature up close! 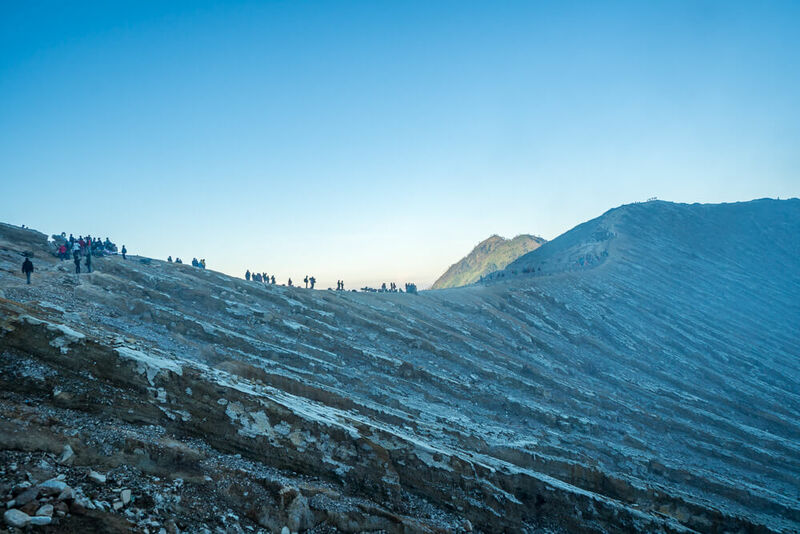 For the majority of people, hiking Mount Ijen is a once in a lifetime chance to enjoy its unique nature. In contrast, for some Indonesians it’s the scene of a daily struggle to extract sulphur from the crater. This sulphur mining is extremely tough work. The sulphur miners have to hike into the crater of Mount Ijen and then carry around 70-90 kilograms of sulphur on their backs as they climb out of the crater, before descending back down the volcano. Miners are only paid a tiny amount for this gruelling work – around 800-1,000 Rupiah per kilo of sulphur. The pay is so bad that some miners make multiple trips every day just to earn more money to provide for their families. Even with multiple trips, miners generally earn less than $10 USD per day. We found the hike tough enough anyway, so we can only imagine how hard it is while carrying 90 kilograms on your back! It’s important to be respectful of the miners when you visit Mount Ijen. Make sure not to get in their way as they want to go as quickly as possible to complete their work. Their hard work is undoubtedly impressive, but at the same time is a sad sight as they risk their wellbeing due to a lack of alternative work available to them. 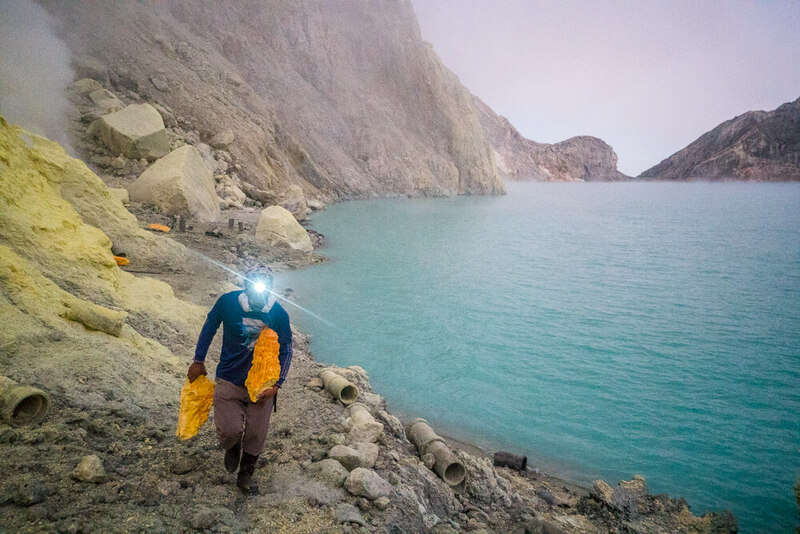 Many of the miners have been trekking up Kawah Ijen almost daily for years just to earn a living. Due to the presence of toxic gases in the crater they risk their health, potentially losing years from their lives and, in some cases, dissolving their teeth. Although some of them have gas masks, the miners are often unable to afford replacement filters and so they are relatively ineffective. Due to the increased presence of tourists at Mount Ijen, the miners have begun making small sulphur figures and ornaments. They sell these at the summit of the volcano to help supplement their income. These figures are relatively inexpensive, starting at around 25,000 Rupiah each depending on the size, so we recommend buying one to help support the miners. Shoes – Wear some comfortable shoes with good grip. On the way down the path can be slippery and having good shoes can make a big difference! Bring lots of water – Climbing Mount Ijen can be pretty tough at times so it’s important to stay well hydrated. Make sure to have at least a couple of litres of water with you so you don’t run out. Gas masks – Some tour companies provide ineffective gas masks, so it’s important to check that you’re given one in good condition. Alternatively, you may want to buy your own gas mask in advance. If you’re going to do that we recommend getting some goggles to protect your eyes too. Get there early for the blue fire! – We’ve already said it but it’s worth saying again – if you want to see the blue fire make sure you arrive as early as possible. It’s only visible in the dark so as soon as the sun rises it can no longer be seen. Make sure to either pick a tour that arrives early or alternatively pay for a private tour and insist on arriving as early as possible! Tours – As we mentioned earlier, we didn’t have the best experience with our tour and we regret not opting for either a private tour or an operator with better organisation. Despite being promised we would arrive in plenty of time to see the blue fire, we only just managed to hike up in time to see it. Even then, it was only possible as we managed the hike to the summit in around 60 minutes, as opposed to the usual 90-120 minutes. We booked through our homestay as it seemed convenient, but this backfired as tours through homestays can be very hit and miss. For a better experience, we recommend going with a more reliable tour company so that you can make the most out of your trip to Kawah Ijen. Food – Different tours offer different things, but from what we saw most didn’t provide any food before the hike. Once you return to the car park after the hike some operators provide a light breakfast such as bananas or soup. Personally, we were a bit surprised no food was provided before we started the hike. We would advise stocking up on some snacks for the day, as otherwise you may have to go a long time without eating. If you don’t get chance to do this there are some stalls selling snacks at the car park. Get a lift up Mount Ijen – If you’re finding the hike too steep it’s actually possible to get a lift up Mount Ijen. Groups of 2-3 locals pull carts up the hill and are willing to pull tourists up the majority of the way in exchange for payment. It looked like incredibly tough work to us. The cost of being pulled up in one of these carts is generally between 600,000-1,000,000 Rupiah. Guides are pushy – Some of the guides at Mount Ijen are extremely pushy when making their way into the crater. They seem to have a complete disregard for other people on the path and will push past you in order to try and get their tour group to the bottom first. This can be quite frustrating, but in reality it’s best just to let them past so that you can take your time as you make your way down. Don’t wear silver jewellery – If you have any silver jewellery, make sure to leave it at your accommodation when you climb Ijen. If you don’t, the silver will react with the sulphur and turn black! Where to go next – After you’ve visited Kawah Ijen, we recommend heading to Probolinggo to visit the beautiful Mount Bromo and stunning Tumpak Sewu waterfall. Probolinggo is around a 5-hour train journey away from Banyuwangi, and it’s well worth the effort to see more of Java’s incredible nature. Banana Homestay is a great budget accommodation option near Mount Ijen. The owners are extremely friendly and are more than willing to help you arrange a tour/trip to Ijen. Although rooms at the property don’t have air con, they are equipped with a fan to help keep you cool during your stay. Rooms start at around 125,000 Rupiah ($9 USD) per night with breakfast included in the price, which makes the property the perfect budget option! Click here to see the latest prices at Banana Homestay! If you’re looking for luxury at an affordable price then the El Royale Hotel and Resort is a great option. It’s one of the few properties in the area with a swimming pool, which is ideal for cooling off in on hot days! On top of that, rooms are comfortable and air conditioned, with breakfast included in the price too. Although the property is located a little bit out of the way, it’s only a 10-minute taxi ride to the centre of Banyuwangi. Rooms start from 543,000 Rupiah ($38 USD) per night. Click here to check out the El Royale Hotel and Resort for your stay in Banyuwangi! The ILLIRA Hotel in Banyuwangi is another great option if you’re looking for luxury. One of the highlights of the property is the wonderful infinity pool, which is a lovely place to relax. On top of that, rooms offer views across Mount Ijen, the Bali Strait or Banyuwangi itself. As you’d expect, the rooms are very comfortable and are fitted with air conditioning to help keep you cool. Although the property is a 10-minute drive from the centre of Banyuwangi, there is a restaurant on site if you don’t fancy venturing out. Rooms start from 514,000 Rupiah ($36 USD) per night, with breakfast included in the price. Click here to check out the latest prices at the ILLIRA Hotel Banyuwangi! 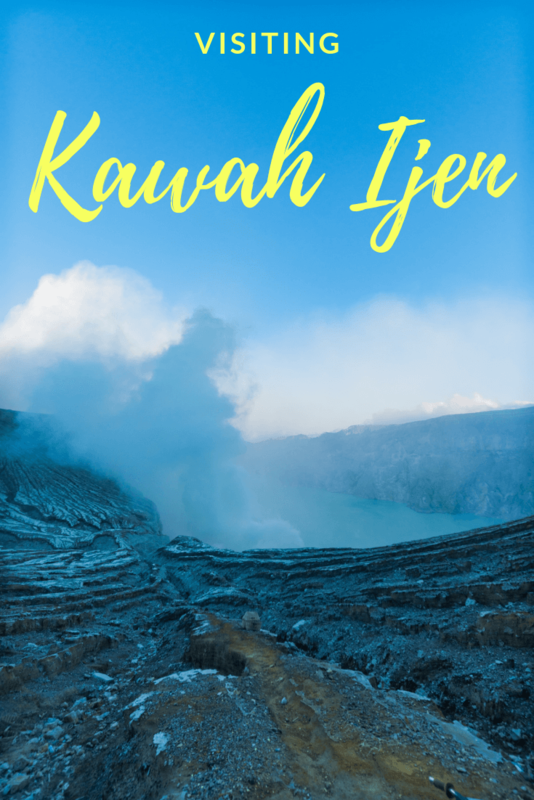 Like this travel guide to Kawah Ijen and the blue fire? Pin it!